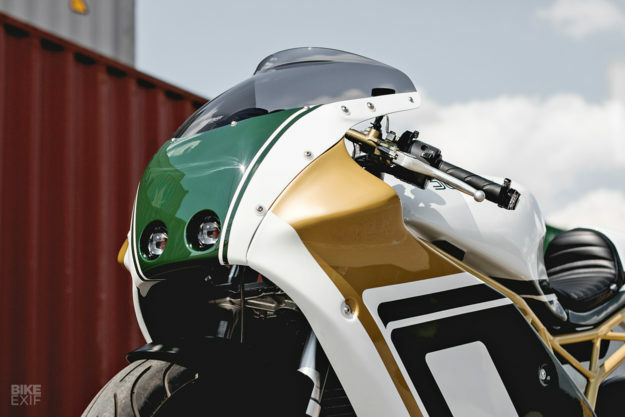 Custom motorcycles are supposed to be one-offs: unique creations that make a statement about the owner or builder. Making a direct copy of someone else’s work is a no-no. But over the years, we’ve heard tales of established builders being asked to replicate another custom bike. The answer is invariably no—and some builders won’t even replicate one of their own previous designs. Jimmy Dressel from Germany’s Kaspeed found himself in this awkward situation. 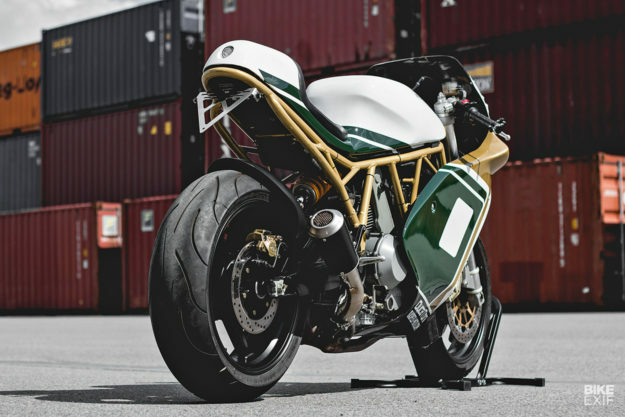 One of his clients had fallen in love with the Ducati racer built by Belgium’s Deep Creek Cycleworks. The client already had a 750SS cafe racer built by Jimmy and his twin brother and father. 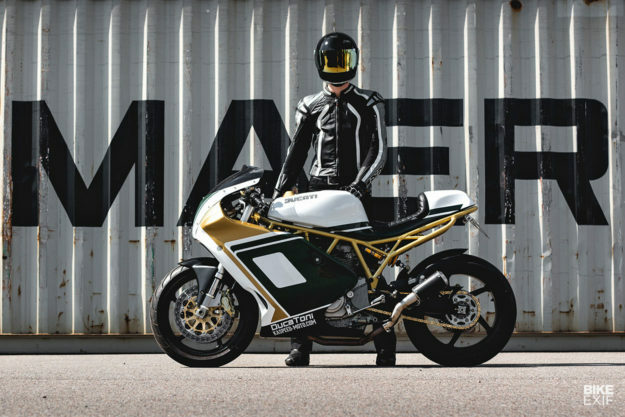 Now he wanted a retro racer suitable for the track days at his local circuit—the Red Bull Ring in Austria. 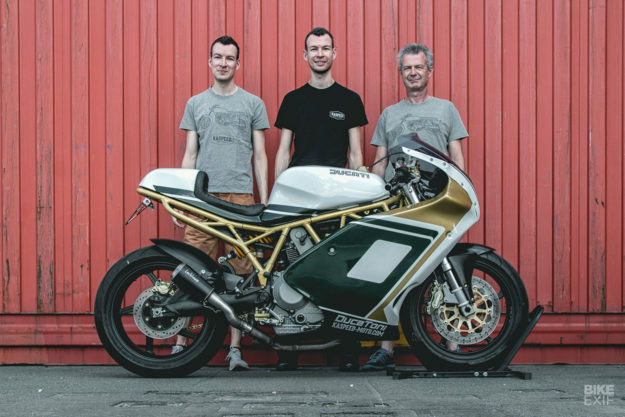 A 2005-spec SuperSport 1000DS was soon on the bench in Kapeed’s workshop, tucked away in the small of Glauchau, Saxony. 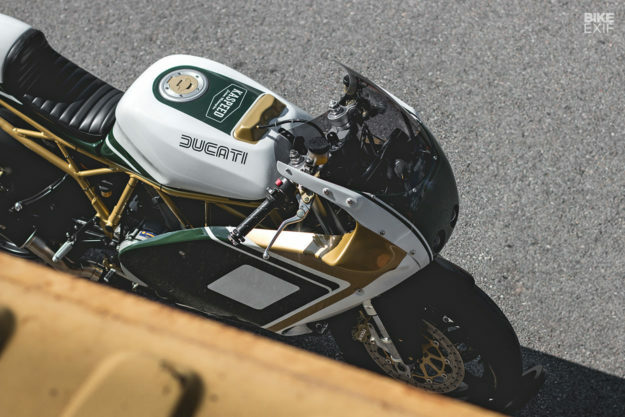 With the best part of 90 hp on tap, Showa adjustable USD forks and a six-speed ‘box, the Ducati would offer plenty of thrills on the track. To err on the prudent side, Jimmy and the crew stripped the bike down. The SOHC twin was refreshed and given a clean coat of high-temp powder. 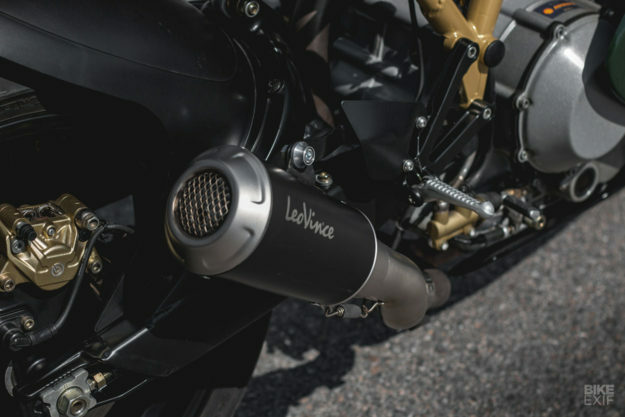 Then it was hooked up to a pair of stubby race-spec LeoVince LV-10 Black Edition mufflers. Custom, removable dB killers help keep the bike road legal. 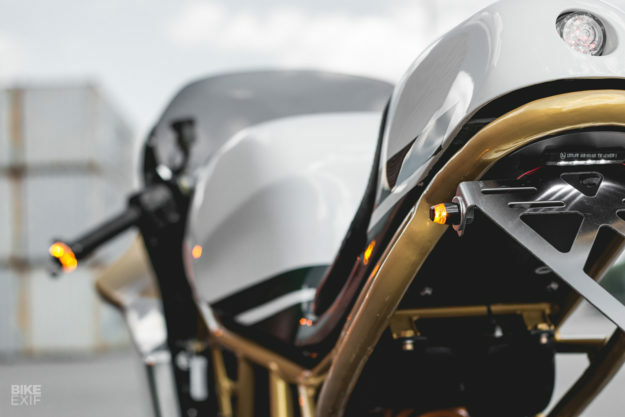 The rear part of the SuperSport frame was tightened up—shortened, detabbed, and fitted with a simple loop. Then the complete trellis was sent away to a specialist for a fresh coat of gold powder. 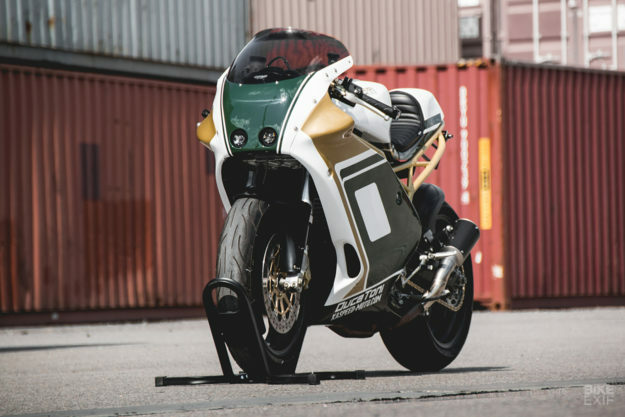 Sitting atop the new frame is a hand built seat unit shaped from scratch—laid up with a mix of carbon fiber, Kevlar and fiberglass, and finished with an integrated taillight. An expert local upholsterer crafted the neat, factory-quality black leather seat. Right ahead is the tank from carburetor-era 900SS, with a 900SS race fairing leading the way. A pair of tiny Shin-Yo ellipsoid headlights, just 38mm in diameter, are flushed into the fiberglass. 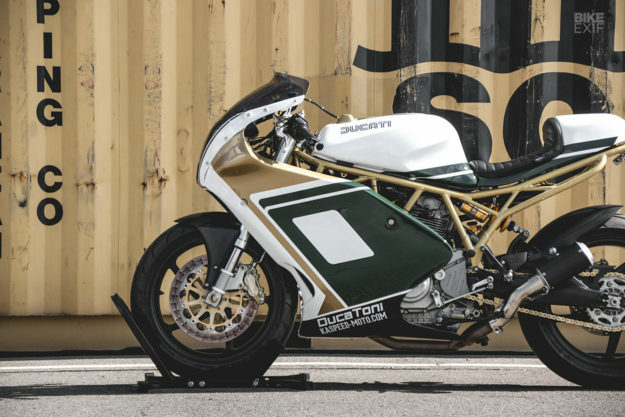 After coating most of the hard parts in a matt black powder, Kaspeed painted the Ducati in-house, giving it a design that echoes the white, fir green and-gold of Deep Creek’s 900ie-powered racer. Kaspeed’s gold is a little more to the fore, and they’ve left off the race numbers that are on the fairing of the Belgian bike. It’ll certainly stand out on track days, with a hard-edged 90s endurance racer vibe.